For other uses, see Shibboleth (disambiguation). A New Orleans resident challenges out-of-towners arrived to protest against the 2017 removal of the Robert E. Lee Monument. Their inability to pronounce "Tchoupitoulas Street" according to the local fashion would be a shibboleth marking them out as outsiders. A shibboleth (/ˈʃɪbəlɛθ, -ɪθ/ ( listen)) is any custom or tradition, usually a choice of phrasing or even a single word, that distinguishes one group of people from another. Shibboleths have been used throughout history in many societies as passwords, simple ways of self-identification, signaling loyalty and affinity, maintaining traditional segregation, or protecting from real or perceived threats. The term originates from the Hebrew word shibbólet (שִׁבֹּלֶת), which literally means the part of a plant containing grain, such as the head of a stalk of wheat or rye; or less commonly (but arguably more appositely) "flood, torrent". In modern American English, a shibboleth can have a sociological meaning, referring to any in-group word or phrase that can distinguish members from outsiders – even when not used by a hostile other group. It is also sometimes used in a broader sense to mean jargon, the proper use of which identifies speakers as members of a particular group or subculture. The term shibboleth can be extended, as in the discipline of semiotics, to describe non-linguistic elements of culture such as diet, fashion and cultural values. Cultural touchstones and shared experience can also be shibboleths of a sort. For example, people about the same age who are from the same nation tend to have the same memories of popular songs, television shows, and events from their formative years. One-hit wonders prove particularly distinctive. Much the same is true of alumni of a particular school, veterans of military service, and other groups. Discussing such memories is a common way of bonding. In-jokes can be a similar type of shared-experience shibboleth. In information technology a shibboleth is a community-wide password that enables members of that community to access an online resource without revealing their individual identities. The origin server can vouch for the identity of the individual user without giving the target server any further identifying information. Hence the individual user does not know the password that is actually employed – it is generated internally by the origin server – and so cannot betray it to outsiders. The term can also be used pejoratively, suggesting that the original meaning of a symbol has in effect been lost and that the symbol now serves merely to identify allegiance, being described as "nothing more than a shibboleth". In 1956, Nobel Prize-laureate economist Paul Samuelson applied the term "shibboleth" in works including Foundations of Economic Analysis to an idea for which "the means becomes the end, and the letter of the law takes precedence over the spirit." Samuelson admitted that "shibboleth" is an imperfect term for this phenomenon. Shibboleths have been used by different subcultures throughout the world at different times. Regional differences, level of expertise, and computer coding techniques are several forms that shibboleths have taken. The legend goes that before the Guldensporenslag (Battle of the Golden Spurs) in May 1302, the Flemish slaughtered every Frenchman they could find in the city of Bruges, an act known as the Brugse Metten. They identified Frenchmen based on their inability to pronounce the Flemish phrase schilt ende vriend (shield and friend), or possibly 's Gilden vriend (friend of the Guilds). However, many Medieval Flemish dialects did not contain the cluster sch- either (even today's Kortrijk dialect has sk-), and Medieval French rolled the r just as Flemish did. example (help·info)) means "Butter, rye bread and green cheese, whoever cannot say that is not a genuine Frisian" was used by the Frisian Pier Gerlofs Donia during a Frisian rebellion (1515–1523). Ships whose crew could not pronounce this properly were usually plundered and soldiers who could not were beheaded by Donia himself. The Dutch used the name of the seaside town of Scheveningen as a shibboleth to tell Germans from the Dutch ("Sch" in Dutch is analyzed as the letter "s" and the digraph "ch", producing the consonant cluster [sx], while in German it is analyzed as the trigraph "sch," pronounced [ʃ]). In Sardinia, 28 April is celebrated as sa dii de s'aciappa (the day of pursuit and capture) or Sa die de sa Sardigna (Sardinia's Day). On that date in 1794 people in Cagliari chased suspected officers of the ruling Piedmontese king and asked them to say nara cixidi (Sardinian for ‘chickpea’), which the Piedmontese could not pronounce. Some 514 officers were thus identified and sent back to the mainland. In October 1937, the Spanish word for parsley, perejil, was used as a shibboleth to identify Haitian immigrants living along the border in the Dominican Republic. The president of the Dominican Republic, Rafael Trujillo, ordered the execution of these people. It is alleged that between 20,000 and 30,000 individuals were murdered within a few days in the Parsley Massacre, although more recent scholarship and the lack of evidence such as mass graves puts the actual total closer to 1,000. During the Black July riots of Sri Lanka in 1983, many Tamils were massacred by Sinhalese youths. In many cases these massacres took the form of boarding buses and getting the passengers to pronounce words that had hard BAs at the start of the word (like Baldiya – bucket) and executing the people who found it difficult. During World War II, some United States soldiers in the Pacific theater used the word lollapalooza as a shibboleth to challenge unidentified persons, on the premise that Japanese people often pronounce the letter L as R or confuse Rs with Ls. In Oliver Gramling's Free Men are Fighting: The Story of World War II (1942) the author notes that, in the war, Japanese spies would often approach checkpoints posing as American or Filipino military personnel. A shibboleth such as "lollapalooza" would be used by the sentry, who, if the first two syllables come back as rorra, would "open fire without waiting to hear the remainder". During the Allied breakout from the Normandy beachheads in 1944, hand-to-hand fighting occurred throughout the hedgerows and thick undergrowth of the Norman countryside. British and American troops were told to use the word "Thunderer" as a countersign through the thick foliage. Given the number of syllables and the leading "th" sound, it was believed that the word would invariably be mispronounced by native German speakers. During The Troubles in Northern Ireland, use of the name Derry or Londonderry for the province's second-largest city was often taken as an indication of the speaker's political stance, and as such frequently implied more than simply naming the location. The pronunciation of the name of the letter H is a related shibboleth, with Catholics and Protestants often pronouncing the letter differently. In Australia and New Zealand, the words "fish and chips" are often used to highlight the difference in each country's short-i vowel sound [ɪ] and asking someone to say the phrase can identify which country they are from. Australian English has a higher forward sound [i], close to the y in happy and city, while New Zealand English has a lower backward sound [ɘ], a slightly higher version of the a in about and comma. Thus, New Zealanders hear Australians say "feesh and cheeps," while Australians hear New Zealanders say "fush and chups." A "furtive shibboleth" is a type of a shibboleth which identifies individuals as being part of a group, not based on their ability to pronounce one or more words, but on their ability to recognize a seemingly-innocuous phrase as a secret message. For example, members of Alcoholics Anonymous sometimes refer to themselves as "a friend of Bill W.", which is a reference to AA's founder, William Griffith Wilson. To the unindoctrinated, this would seem like a casual – if off-topic – remark, but other AA members would understand its meaning. Similarly, during World War II, a homosexual US sailor might call himself a "friend of Dorothy", a tongue-in-cheek acknowledgment of a stereotypical affinity for Judy Garland in The Wizard of Oz. This code was so effective that even after the higher command learned that the phrase was a way for gay sailors to identify each other, they failed to recognize its origins, and purportedly invested a great deal of time and effort into hunting down this "Dorothy", whom they assumed to be an actual woman who was somehow assisting and organizing homosexual servicemen. Mark Twain used an explicit shibboleth to conceal a furtive shibboleth. In The Innocents Abroad he told the Shibboleth story in seemingly "inept and uninteresting" detail. To the initiated, however, the wording revealed that he, Twain, was a freemason. Colombian conceptual artist Doris Salcedo created a work titled Shibboleth at Tate Modern, London, in 2007–2008. The piece consisted of a 548-foot-long crack that bisected the floor of the Tate's lobby space. It represents borders, the experience of immigrants, the experience of segregation, the experience of racial hatred. It is the experience of a Third World person coming into the heart of Europe. For example, the space which illegal immigrants occupy is a negative space. And so this piece is a negative space. In an episode of The West Wing titled "Shibboleth", President Bartlet discusses the meaning of the word at length. His advisors believe it is a catch phrase or cliche, after which Bartlet reminds them of its earlier biblical significance. He later becomes certain that a group of Chinese religious asylum seekers are indeed Christian when their representative uses the word to refer to his faith during a meeting. ^ Concise Oxford Dictionary, 8th ed, (Oxford University Press, 1990), 1117. ^ Merriam-Webster Dictionary, shibboleth, accessed online 22 September 2015. ^ Collins English Dictionary, shibboleth, accessed online 22 September 2015. ^ Wahrig Deutsches Wörterbuch, Sixth Edition and "Schibboleth". Meyers Lexikon online. ^ The context was the crossing of the River Jordan; according to E.A. Speiser, op. cit., 10, the medieval Hebrew commentators and most modern scholars have understood it in this alternative sense. ^ Speiser, E.A. (February 1942). "The Shibboleth Incident (Judges 12:6)". Bulletin of the American Schools of Oriental Research. University of Chicago Press. 85: 10–13. JSTOR 1355052. ^ Hendel, Ronald S. (February 1996). "Sibilants and šibbōlet (Judges. 12:6)". Bulletin of the American Schools of Oriental Research. University of Chicago Press. 301: 69–75. JSTOR 1357296. ^ a b Richard Hess; Daniel I. Block; Dale W. Manor (12 January 2016). Joshua, Judges, and Ruth. Zondervan. p. 352. ISBN 978-0-310-52759-6. ^ Dorman, David (October 2002). "Technically Speaking: Can You Say "Shibboleth"?". American Libraries. American Library Association. 33 (9): 86–7. JSTOR 25648483. .
^ Samuelson, Paul A. (1977). "When it is ethically optimal to allocate money income in stipulated fractional shares". Natural Resources, Uncertainty, and General Equilibrium Systems: Essays in Memory of Rafael Lusky. New York: Academic Press. pp. 175–195. ISBN 978-0-12-106150-0. Retrieved 2011-02-03. ^ Samuelson, Paul A. (February 1956). "Social Indifference Curves". Quarterly Journal of Economics. 70 (1): 1–22. doi:10.2307/1884510. Retrieved 2011-02-03. ^ Devries, Kelly. Infantry Warfare in the Early 14th Century. N.p. : Boydell, 1996. Print. ^ Although the website Language Log: Born on the 11th of July says that the /sχ/ cluster in schild that makes it difficult for French-speakers to pronounce had not yet developed in the 14th century, the phrase "scilt en vrient" is referenced in primary sources such as the Chronique of Gilles Li Muisis as distinguishing French from Flemish. ^ "Greate Pier fan Wûnseradiel" (in Western Frisian). Gemeente Wûnseradiel. Retrieved 2008-01-04. ^ McNamara, Tim (2005). "21st century shibboleth: language tests, identity and intergroup conflict". Language Policy. 4 (4): 351–370. doi:10.1007/s10993-005-2886-0. ^ Hyndman, Patricia. "-Democracy in Peril, June 1983". Lawasia Human Rights Standing Committee Report -Democracy in Peril, June 1983. ^ "Passport to life". Daily News. Daily News (Sri Lanka's state broadsheet). Retrieved 27 April 2015. ^ Gramling, Oliver (1942). Free Men are Fighting: The Story of World War II. Farrar and Rinehart, Inc. p. 315. Retrieved 17 February 2018. ^ "Court to rule on city name". BBC News. 7 April 2006. Retrieved 30 November 2015. ^ "Speech and accent". Te Ara – The Encyclopedia of New Zealand. 5 September 2013. Retrieved 18 January 2019. ^ "What is Friends of Bill W. on a Cruise?". cruisecritic. Retrieved 19 January 2019. ^ Jones, Alexander E. (1954). "Mark Twain and Freemasonry". American Literature. Duke University Press. 26 (3): 368–9. JSTOR 2921690. ^ Alberge, Dalya (9 October 2007). 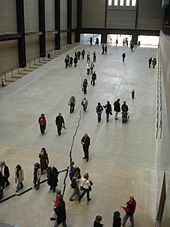 "Welcome to Tate Modern's floor show – it's 167m long and is called Shibboleth". The Times (69137). London. p. 33. ^ Trevor Parry-Giles; Shawn J. Parry-Giles (2006). The Prime-Time Presidency: The West Wing and U. S. Nationalism. University of Illinois Press. p. 101. Look up shibboleth in Wiktionary, the free dictionary. "Shibboleth" . Encyclopædia Britannica (11th ed.). 1911.